At the book signing of Hillary Clinton’s memoir “What Happened,” I happily found myself in line with Kristen Browde, attorney and former Emmy-award-winning CBS news reporter, who recently put in her bid to become the next supervisor of New Castle – and the first transgender women on the New York Democratic ticket. 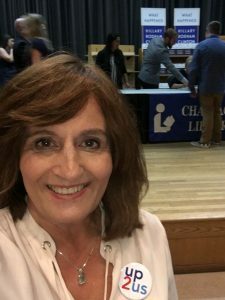 The wait was long, but it gave me the opportunity to take a deep dive into Candidate Browde’s thoughts and advice on what it takes to be a successful speaker, debater, and politician – and her experience running as a woman and a transgender candidate. And, how app LikeSo: Your Personal Speech Coach can help! AMC: As a longtime news correspondent, and now as a politician, and the first transgender woman candidate to run on major ticket in New York, I am sure you learned a lot about what it takes to be an articulate, confident, substantive communicator. Is there any advice that you can offer others? KB: My number one tip is simple to say, but not as easy to put into practice. Stop worrying about the script. Remember the message. If you try to precisely recite something you end up stumbling over the words. If you just tell your story you rarely stumble and almost always deliver your message with a passion that is instantly heard as authentic. AMC: There is nothing better than a great speech delivered by a great leader. Why do you think communications skills are critical and integral to both running for office and winning? KB: It’s an old line, but a leader without followers is just someone going for a walk. Recognizing that if you want to gain support for your movement, or even for your life in business, you have to be able to express yourself effectively, in a way that the people to whom you’re speaking not only recognize the truth of what you’re saying but feel it resonating within them. You can’t persuade if you can’t communicate, so working on your ability to deliver your message is one of the most important things anyone aspiring to any leadership position can do is work on communicating effectively. AMC: As a politician, you are your brand. What goes into developing a great 30-second elevator pitch? A great 3-5 minute stump speech? KB: I wish an elevator pitch was 30 seconds! It’s closer to nine to ten seconds. You need a hook and you need to be able to articulate why you’re running. Then, if you get a spark of interest, you can launch into a more detailed stump speech, one that should always be personal, should always be focused on what you can deliver to the voters for whom you want to work, and be interlaced with the story of why you’re the one who can and should do the job. If you tell that story and if your message meshes with the hopes and dreams of those to whom you’re speaking, you’ll be on the way to building your brand and winning your next election. AMC: In our polarized society, there is so much to debate. Communication and debate are the keys to making civic life and civil discourse possible. No doubt this past election and our new administration have reinvigorated the importance of respectful and reasoned debate – a public, in-person, way to discuss opposing views and controversial issues. How do you practice for debates and how do you think tools like the LikeSo app can help? KB: There are two things critical to my preparation: 1) honing the position to a concise, well-articulated statement, and 2) getting comfortable with speaking it instead of just writing it on paper and reading it. The LikeSo app helps me strip out the filler, and by working in the app and repeating delivering the answers gets me to the point that I stop worrying about the words themselves and focus on speaking to my audience. AMC: How has being transgender impacted your candidacy? KB: Here’s the thing about gender: I’ve now been to the homes of over 1000 New Castle voters. Exactly five have brought up gender. One slammed the door in my face, one made a snarky comment, and three said something about me deserving support for bravery or being a pioneer… but I don’t see this as anything like that at all. I believe that the measure of a person is what they do for others. And this is a different venue for me, but it’s really just a continuation of the work I’ve done in the past. As to conservatives, one of our strongest supporters is a Republican woman who I met going door to door. Believe it or not we started bonding over pearls (we were both wearing them) and that led us into a deeper conversation.